On Saturday, September 29, 2012, the Henry B. Plant Museum will open its doors free of charge along with 1,400 other participating venues for the eighth annual Museum Day Live! This immensely successful program, in which the Henry B. Plant Museum will emulate the free admission policy of the Smithsonian Institution’s Washington, D.C.-based facilities, encouraging learning and the spread of knowledge nationwide. For one day only, the Henry B. 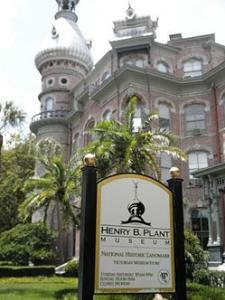 Plant Museum will grant free access to visitors who download a Museum Day Live! ticket at Smithsonian.com. Last year’s event drew over 350,000 museum-goers. The Museum Day Live! Ticket is available by downloading at Smithsonian.com/museumday. Visitors who present the Museum Day Live! Ticket will gain free entrance for two participating venues for one day only. One ticket is permitted per household, per email address. For more information about Museum Day Live! and a list of participating museums and cultural institutions, please visit Smithsonian.com/museumday. Parking is available in the Faculty and Staff parking lot on the west side of Plant Hall. Thats it for now, but stay tuned for more information on things to do in Tampa Bay!